I'm so exhausted. I had to go to the grocery store after work and everyone else had the same idea. Of course I was by myself and they had their extended family all standing in the way. I literally had to dodge people several times when I went to get something off the shelf and they'd dart in front of me. Also, like why didn't they stock the shelves when it was slower and not at 5pm and it's obviously super busy? I don't think that's the time to bring out 2 big carts and park them in the dairy aisle. So $340 later if we need anything else we'll be getting it from the Mexican market by my work or the gas station. Work was pretty busy today, partially because I wasn't there on Friday and people are returning documents that I requested in the mail. I had to explain to an elderly lady today that her trust paper didn't say that her property was no longer in her trust, but that once she dies THEN the trust goes away and it goes to her son. She thought for sure she paid someone to change that. I was like uh might want to call that person and check up on it just for your piece of mind. 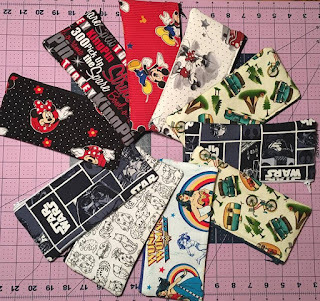 I spent almost all weekend sewing. Since I had all the stuff pulled out for the sunglasses cases I just sewed up a few more to use the batting I had on hand up. So I'll have a lot of those for my upcoming events. 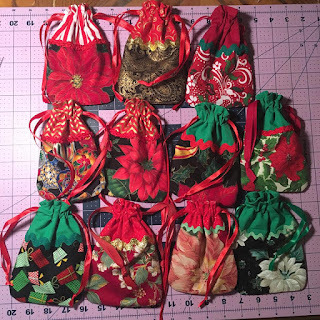 Yesterday I worked on making some little Christmas Treasure Bags. Someone pointed out that they are a good size for gift cards so I thought I'd make up some Christmas ones. These basically cost nothing to make (except lots of time lol) since they are all scraps and ribbon I've had forever. Next I'm going to work on some more key fobs, some 49er's ones to start since everyone keeps asking me for those. But actually first I have to make a man's bow-tie out of Toy Story material. I had to order the material and it just got here today. The event they need it for is coming up quick so I need to make it tomorrow. I need to figure out what pattern to use for it. Once I'm done procrastinating haha. I'm currently waiting for all my bedding to get washed. I don't think I'm going to be able to stay awake for the last load in the washer to get done. Have to wait for the stuff in the dryer at least though. Oh also wanted to comment on a show I watched on Netflix this weekend. I watched Wanderlust while I was sewing. I know the popular opinion is probably that it's trash but I thought it was pretty good and thought provoking Have you watched it? What did you think? 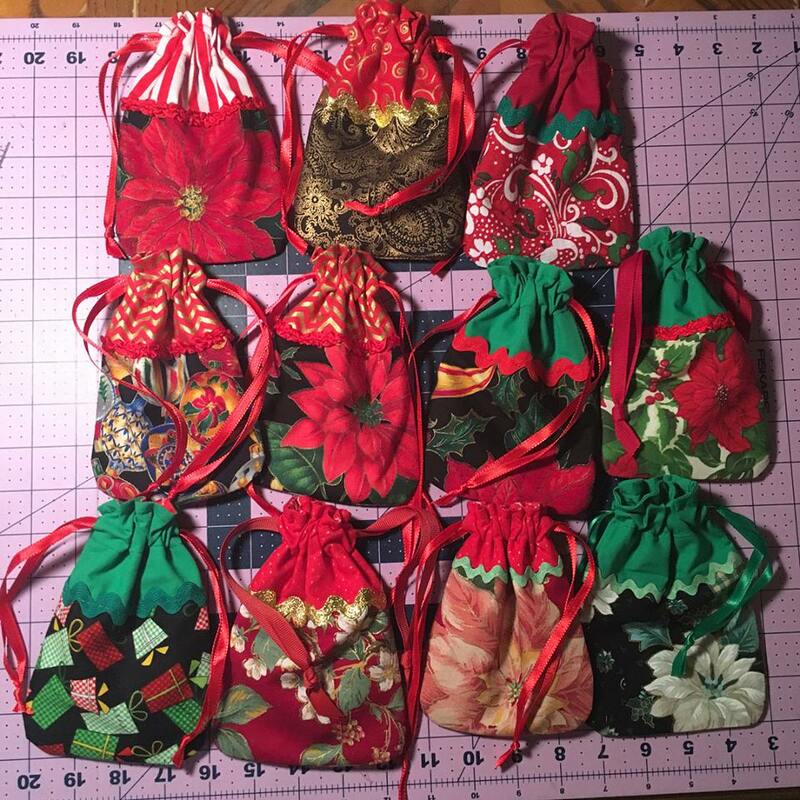 Oh those little gift bags are precious! Wanderlust is sitting in my list. I love Toni Colette. Isn't she the lead female? I hope to watch some movies this weekend. I just some crap and it was so bad I won't even mention the name. I looked at Rick and said, "Why are we watching this?" He told me it was a train wreck, he know he shouldn't look but he can't help it. I left the room to do other things.